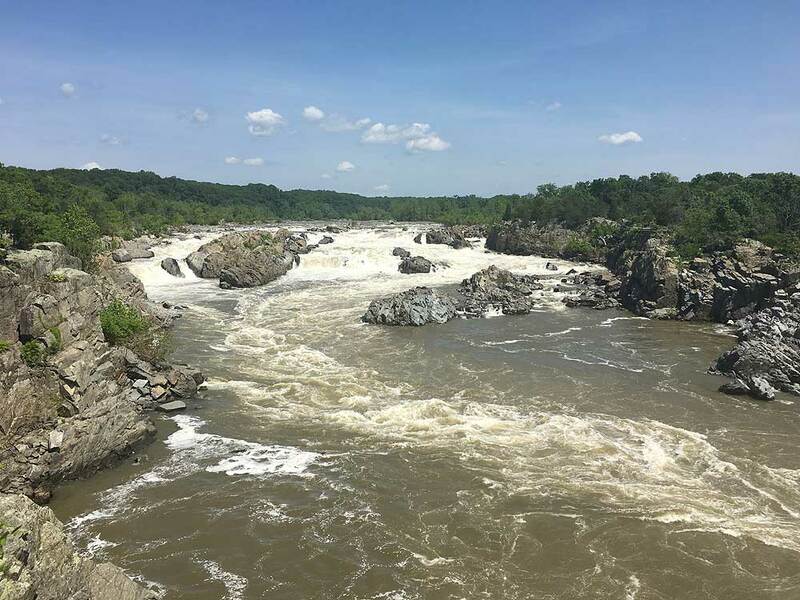 With fifty percent of the Difficult Run hike following the Potomac River at one of its most scenic spots, it's easy to see why so many people make Great Falls Park one of their favorite local hikes. 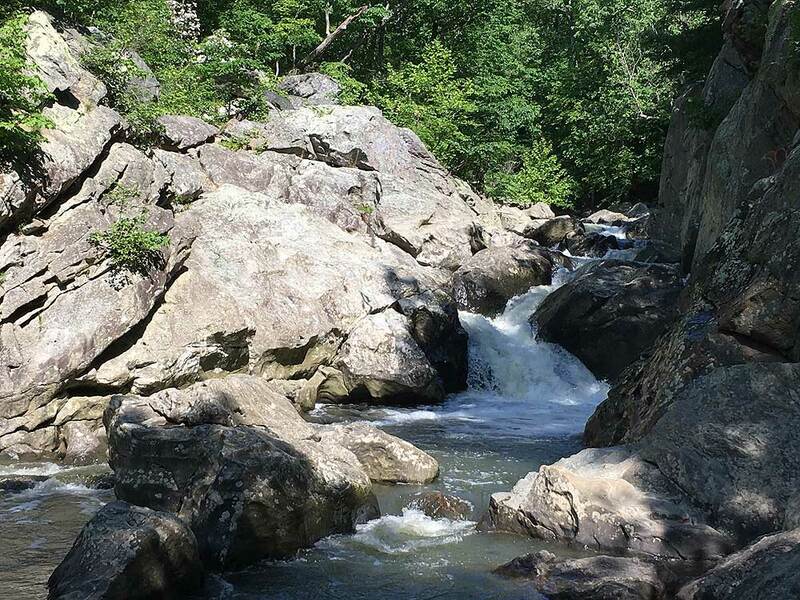 Difficult Run drops over several small waterfalls as it winds its way to the Potomac River, where the Potomac River passes through a deep gorge with fast moving water. 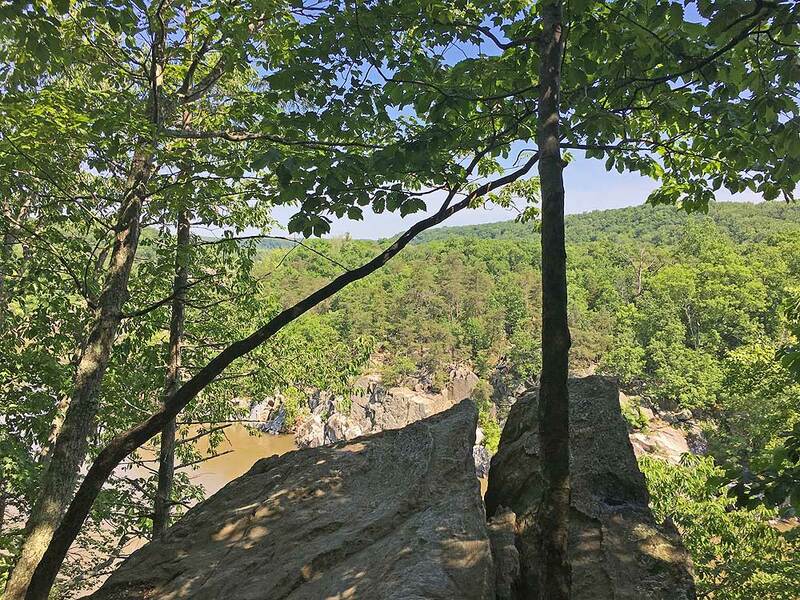 Just 2.8 miles from the Scott's Run Nature Preserve, this is one of two scenic loop hikes just outside the Capital Beltway. 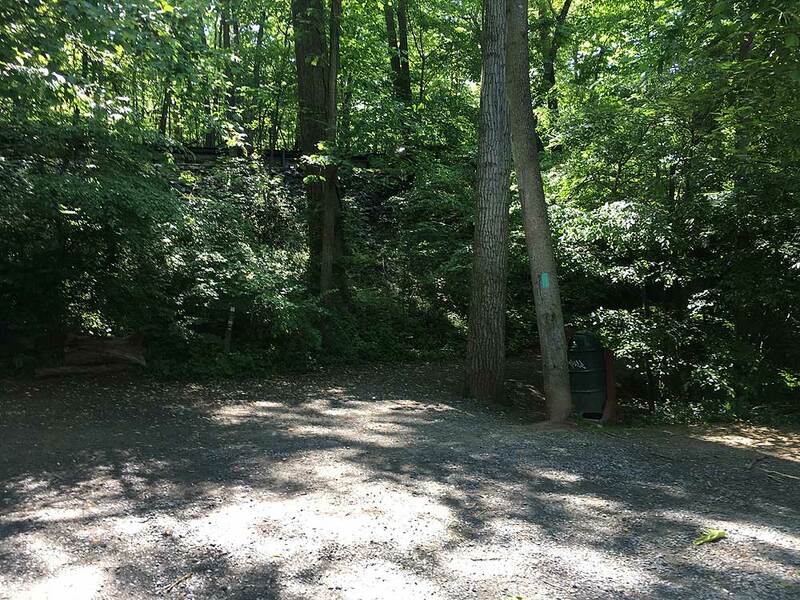 From the end of the parking area, take the Difficult Run Trail as it follows the run bank before passing under Georgetown Pike in 0.3 miles. 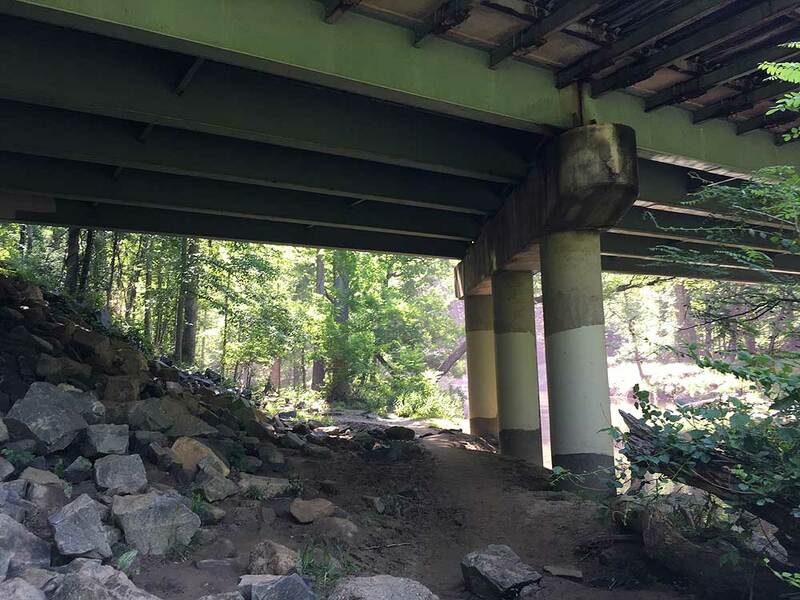 Just after passing under Georgetown Pike, the trail will become wider as it continues along Difficult Run for another 0.9 miles and past the junction of the Ridge Trail on your left. 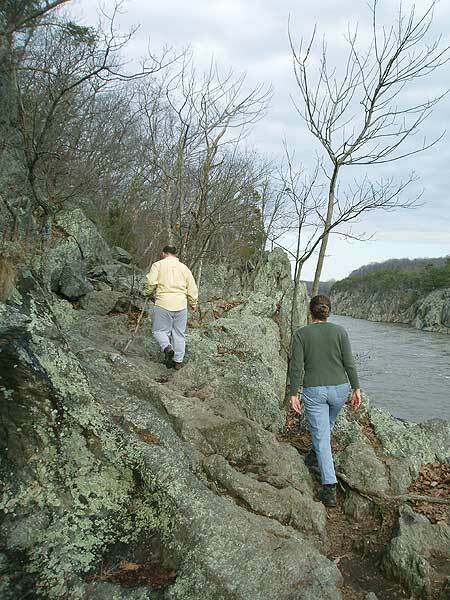 Continue downhill past the Ridge Trail, where the Difficult Run Trail ends at the confluence of the Potomac River. Return to the intersection of the Ridge Trail and turn right. 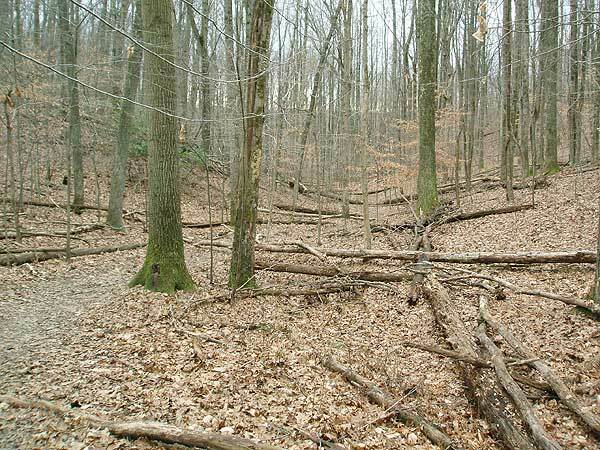 Follow the trail to the top of the rise and turn left following the ridge. 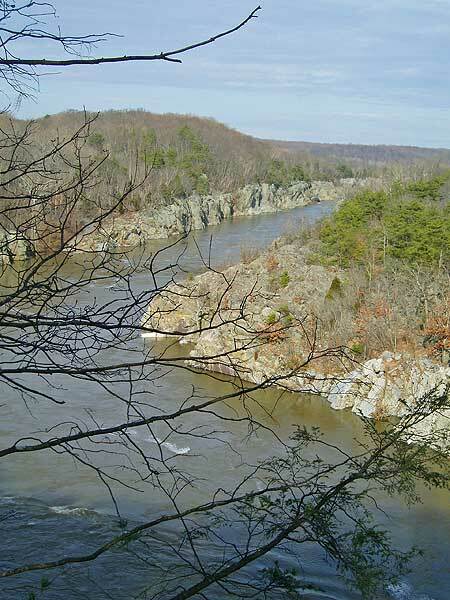 In 0.5 miles turn right downhill on the blue blazed River Trail as it steeply descends toward the Potomac River. 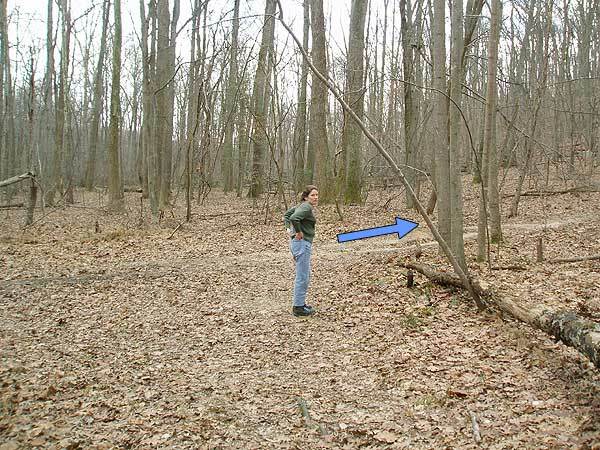 The trail is hard to spot in places because of blow downs, just follow the blue blazes. 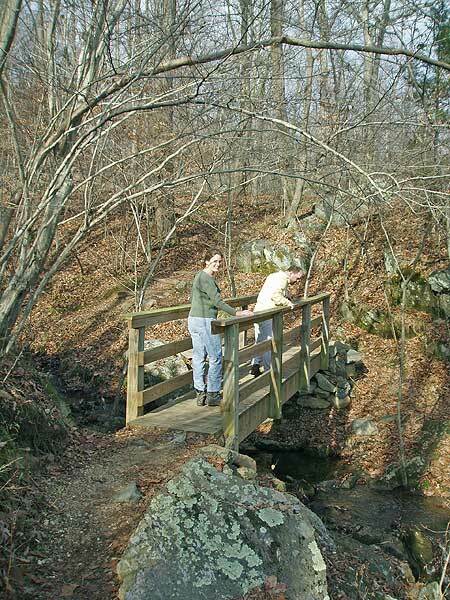 The trail passes over a small footbridge and a paved road, then continues just to the right on the other side. 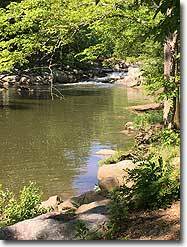 Continue on the blue blazed trail as it follows the river before arriving at Patowmack Canal ruins. 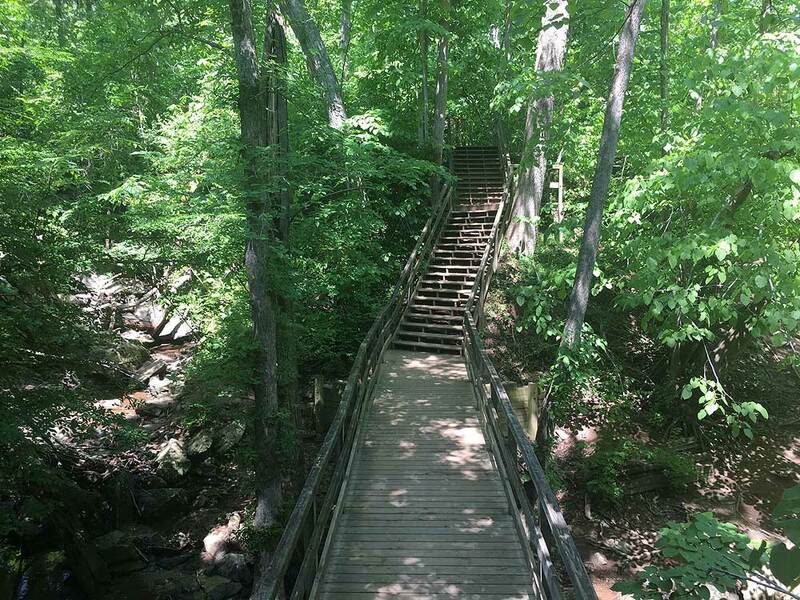 In 50 yards, turn right over the footbridge then left following the green blazed River Trail. 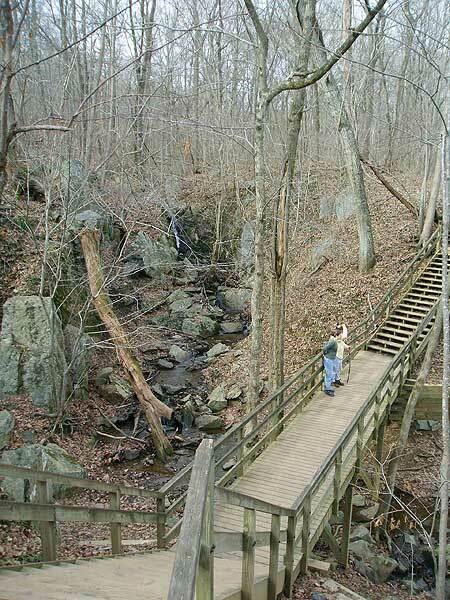 The trail will descend over a large footbridge before arriving at the main picnic area of Great Falls Park. 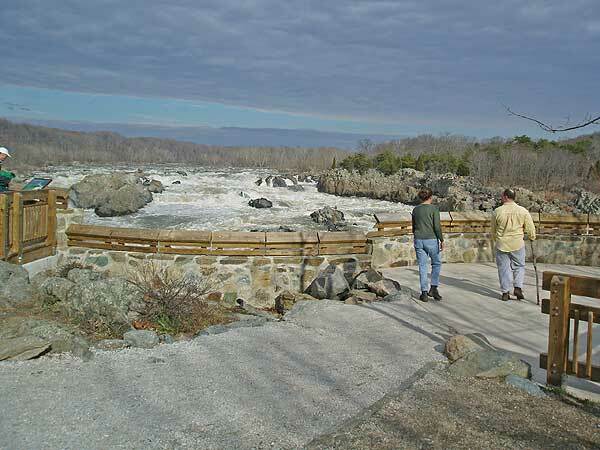 Stay right and pass the two main scenic overlooks at Great Falls Park. 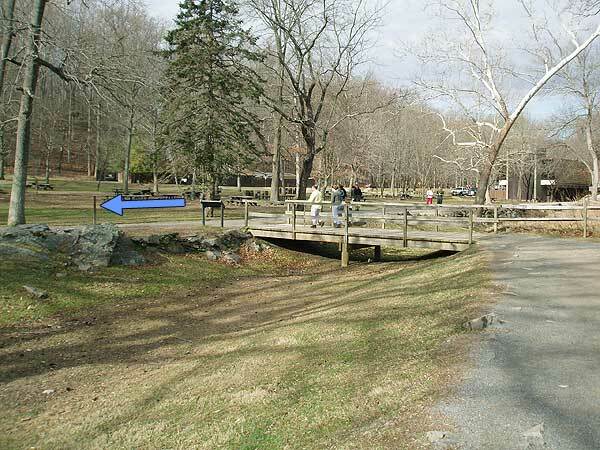 Just past the second overlook, cross the footbridge turning left back through the picnic area. 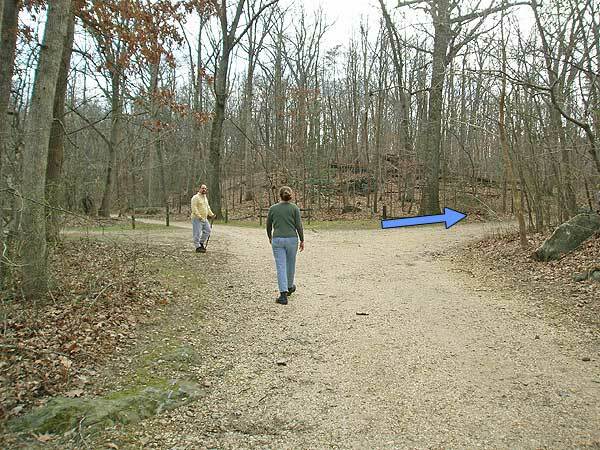 Stay right, then at the fork, bear left towards the bathroom facilities (right is a parking area). 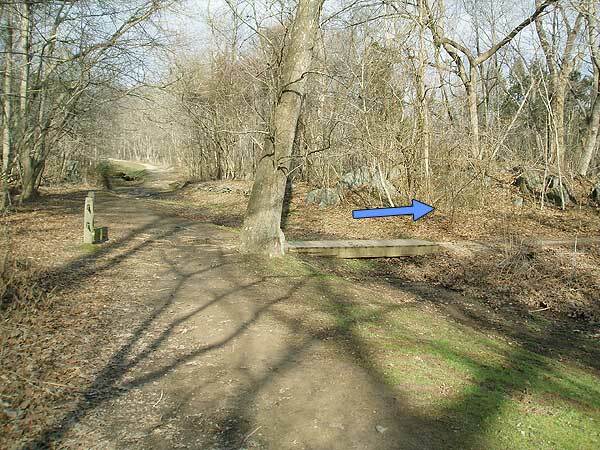 After passing the bathrooms, turn right onto the Old Carriage Road. In 0.5 miles, turn right on the Swamp Trail. Follow the Swamp Trail for 0.4 miles where it ends at the next trail junction. Turn right climbing over the hill and in 0.3 miles the trail ends at the junction of the Ridge Trail. 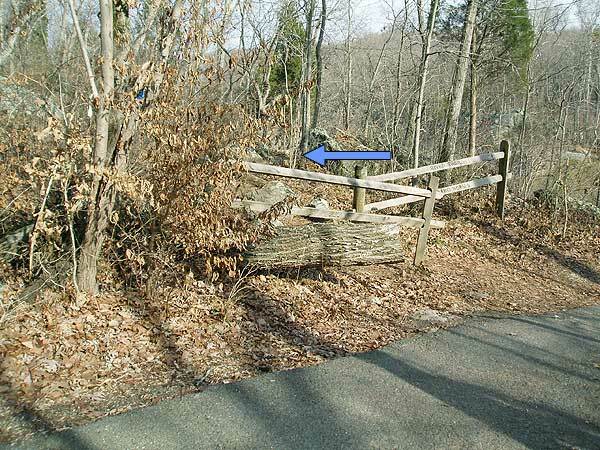 Turn left, and in 60 yards, at the bottom of the depression, a small trail marked only by a single split rail post turns right downhill. 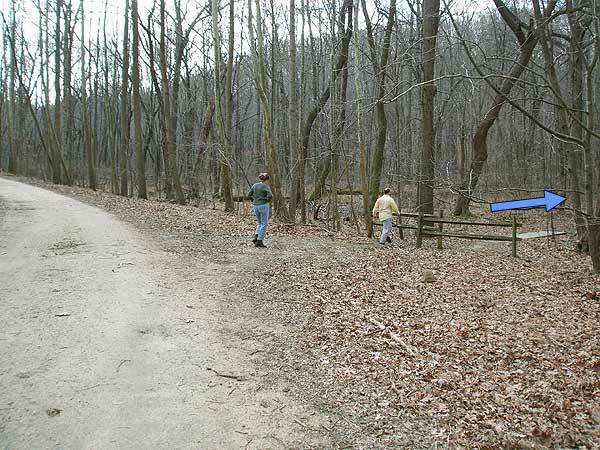 Turn right on the trail as it heads down the ravine for the remaining 0.2 miles back to Georgetown Pike and the parking area. Use Extreme Caution crossing Georgetown Pike back to the parking area. 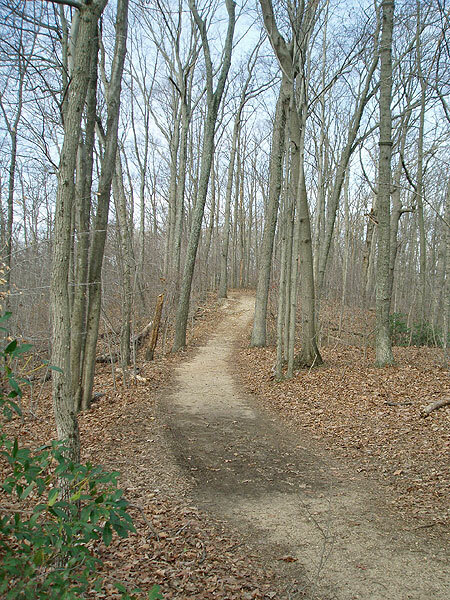 While not blazed, the trails are easy to follow in most places. There are several parts where the trail is iced over so watch your step! We started at 9am at the Georgetown Pike parking lot. 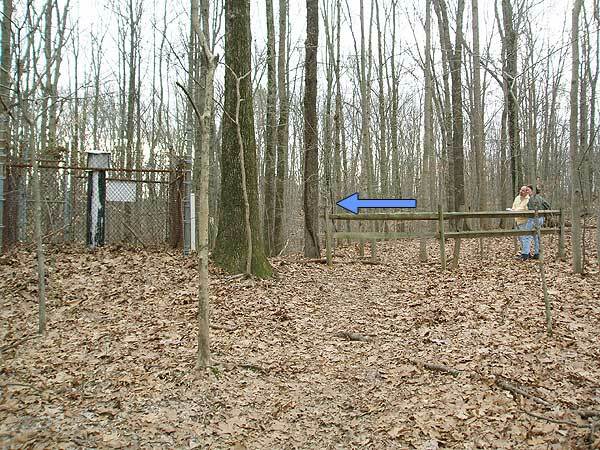 There's actually 3 trails that meet there, take the farthest east trail entrance that has a small sign post (not the trail with the large cross county map and not the trail across Georgetown Pike. Get to the parking lot early it was almost full at 9am on Saturday when we started. 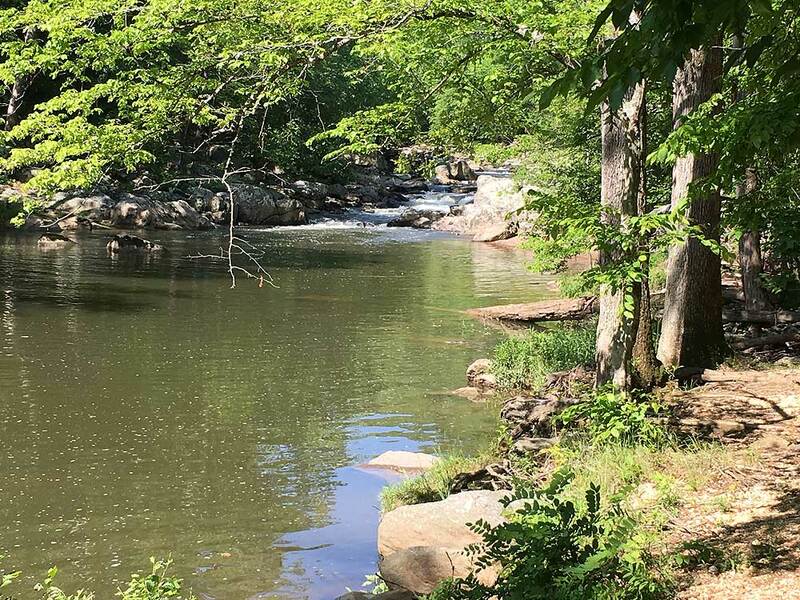 This hike took us about 5 hours but we stopped for lunch at the picnic area near the bathrooms and checked out most of the overlooks and small paths by the river. Everything is well signed but the blaze is now green instead of blue. Definitely take the Swamp Trail since we saw maybe two people on that trail and it was quite beautiful. 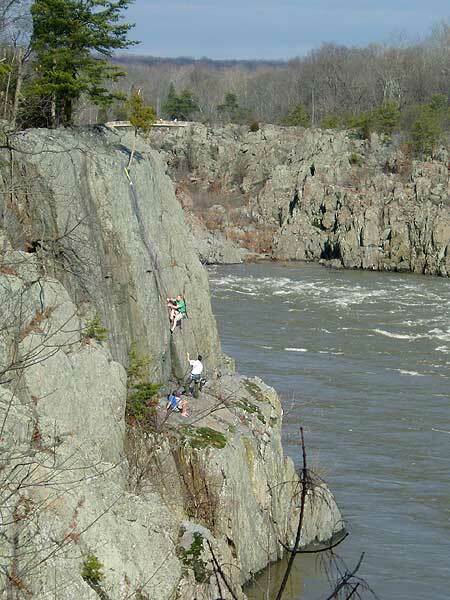 I'll try this hike again in Fall/Winter to see the views without the leaves- perhaps in the reverse. 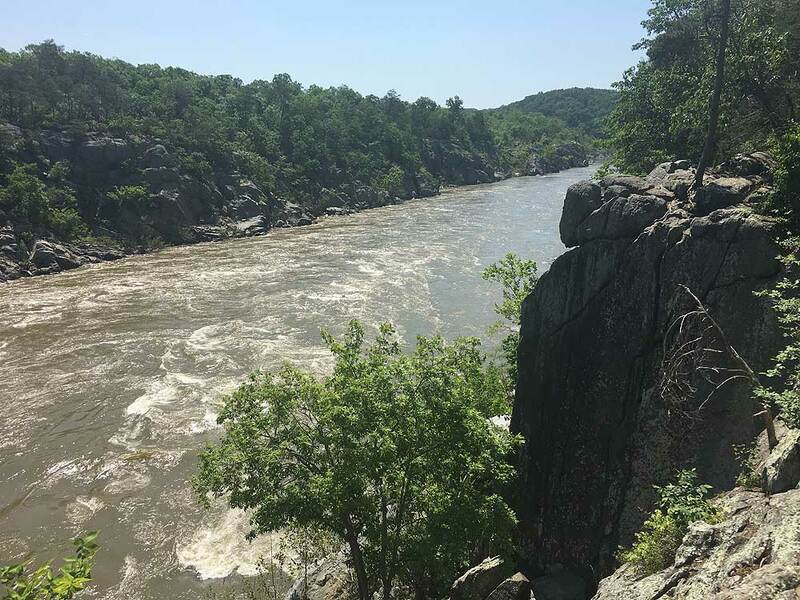 Hiked this trail today (Friday) after work. Start about 6:30 or so, and was practically the only one one the trail, until I got to the main part of the park. I was expecting crowds after reading the previous reviews, but that just didn't materialize. 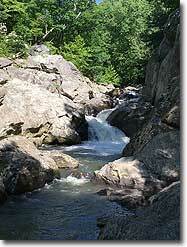 The hike is beautiful, with tremendous water views along most of the hike. 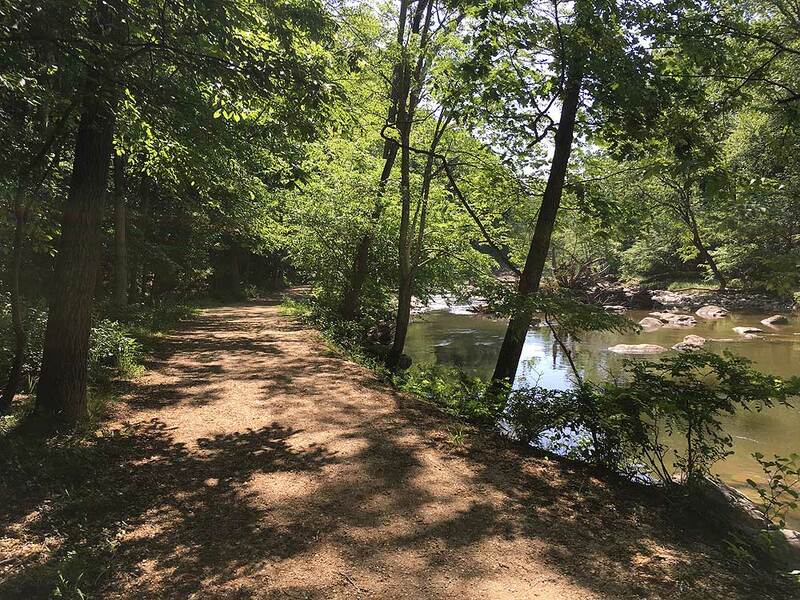 The River Trail is green blazed,not blue. And it is indeed hard to pick up after the steep descent. 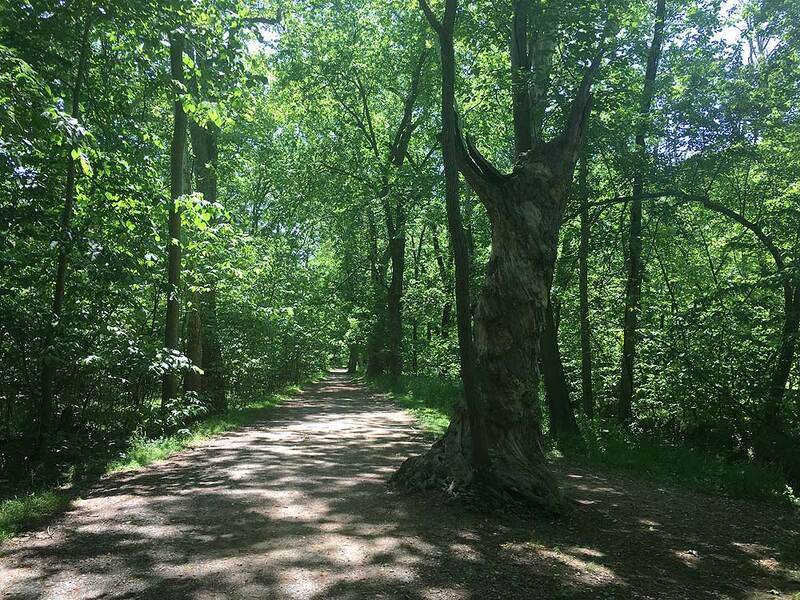 Just keep walking towards the park, and you will eventually cross the paved road and know that you are on track. 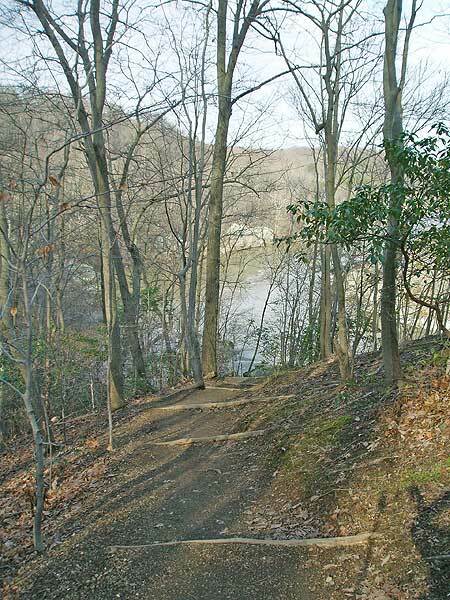 Once I got to the park, and passed the second overlook, I had a little bit of trouble finding Carriage Road. 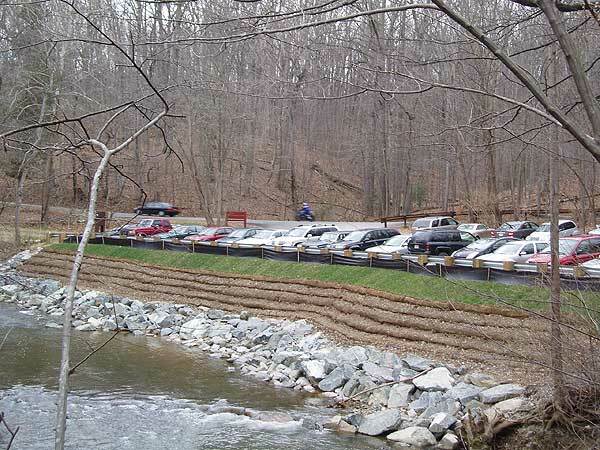 The bathrooms and parking lot referred to in the right up are not the bathrooms and parking lot by the Visitor's Center. Once I realized that, I was back on track. All in all a great hike. Got back to my car at about 8. Would have taken more time but was walking fast so as to not run out of daylight. 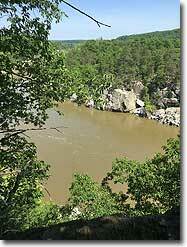 News flash: there are millions of people who live in the DC area, and many of them (us), enjoy a nice hike, especially on the weekends. Giving this hike a low rating because it is in a heavily populated area seems unfair at best you knew where it was when you ventured out, no? 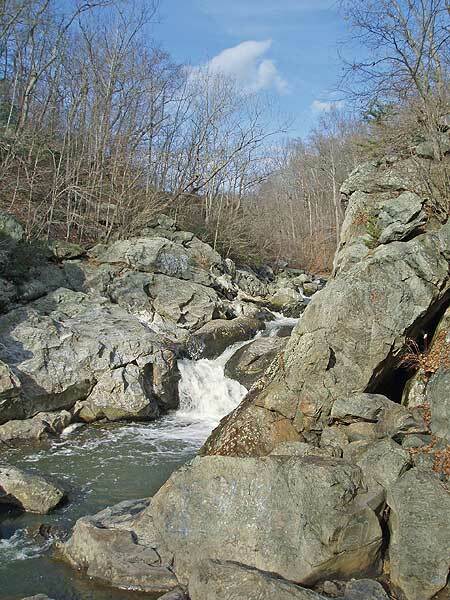 In fact, since I live in DC, the location of this hike is a 5-star aspect of it! (See, it's all about your perspective.) 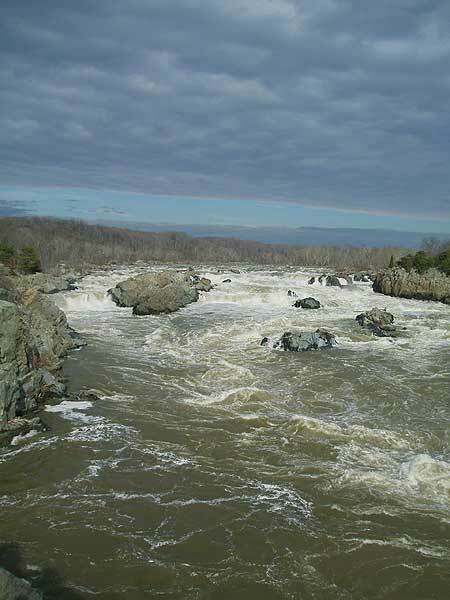 The vistas and water views are spectacular, especially when the Potomac is rushing as it has been. 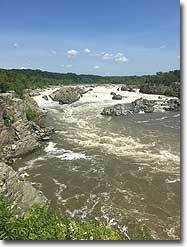 All this and only a few miles outside of the beltway? I'll take it. I like this hike so much I did it twice in the last few days. 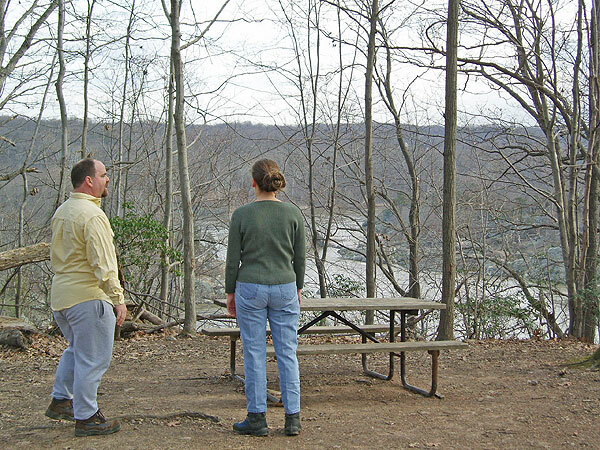 Once with friends on Sunday - yep, it was crowded, but only around the main overlooks and visitor center. 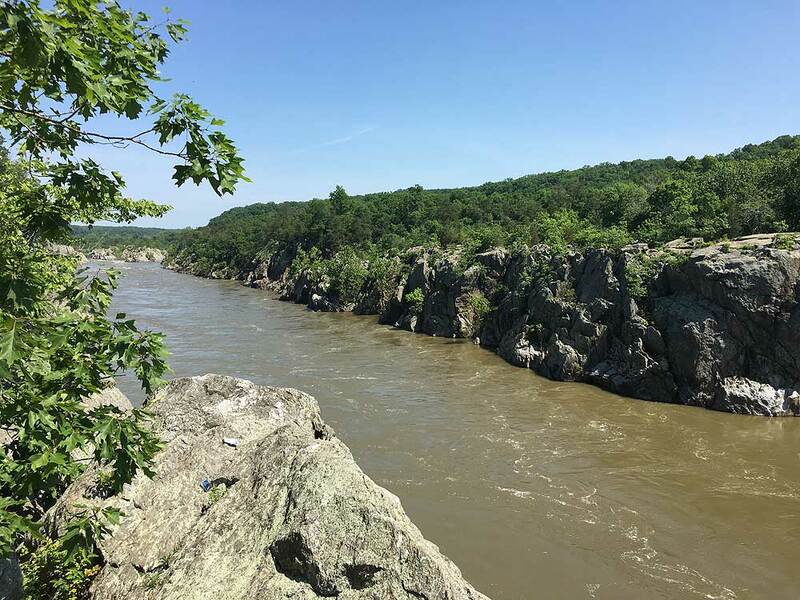 The rest of the time was what you'd expect for a beautiful 65-degree Sunday on any popular hike within an hour or two drive from DC, and we had our choice of spectacular and solitary lunch spots overlooking the Potomac. 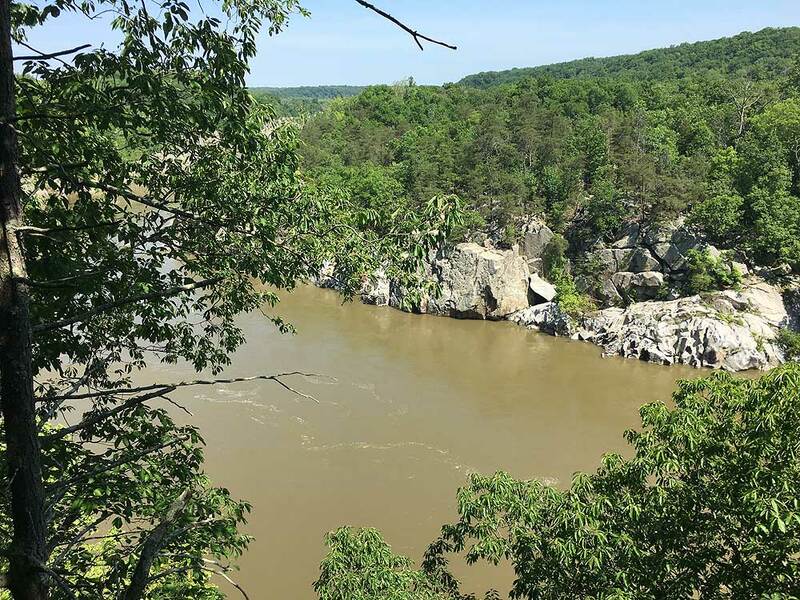 I did the hike again Tuesday, and didn't see a single person on the Swamp Trail, and saw fewer than a dozen people - and two giant horses - on the River Trail - on another cloudless 65-degree day. 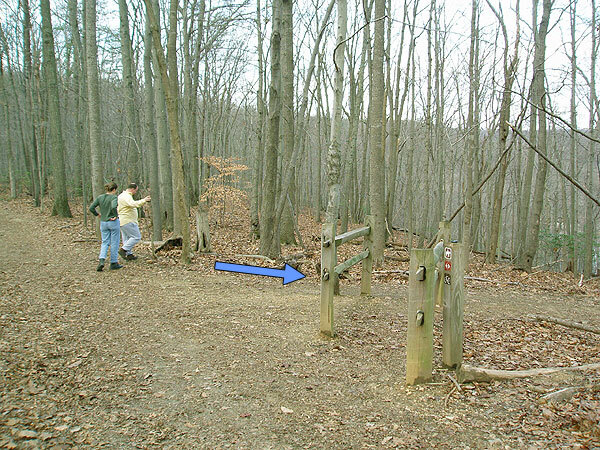 Some tips: If you want to follow the route on the map linked to above, start your hike at the opposite end of the parking lot from the entrance to the lot. 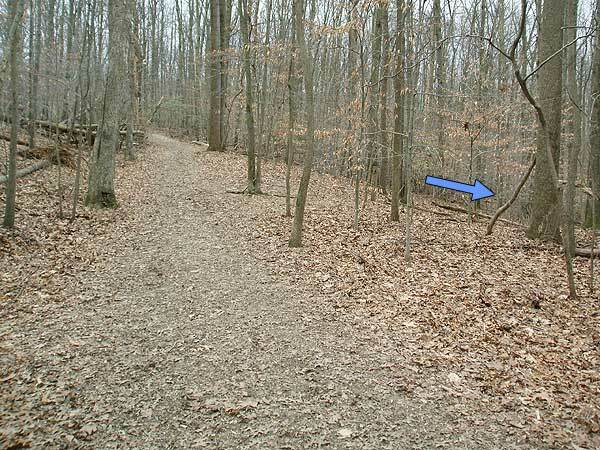 There is a sign/map right at the entrance to the parking lot that practically begs you to start out on the trail that leads directly from there, but this trail is not park of this hike. You know you're on the right path (literally) if the water is on your right as you start the hike. 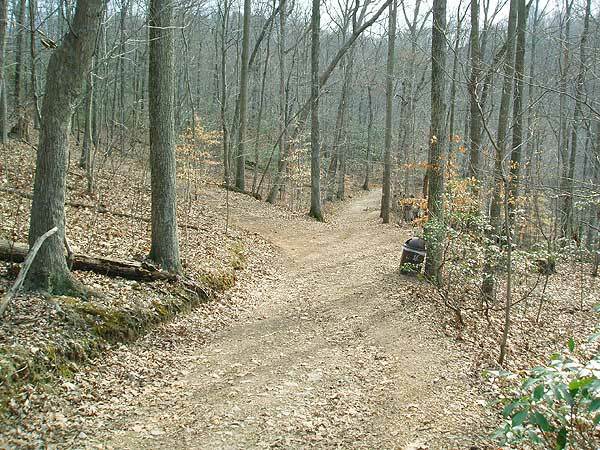 I actually prefer to reverse this loop, doing the Swamp Trail first and then heading to the River Trail, because I like to torture myself with that big uphill part. To do it this way, start the hike by starting on the Swamp Trail by crossing the road where you turned into the parking lot. 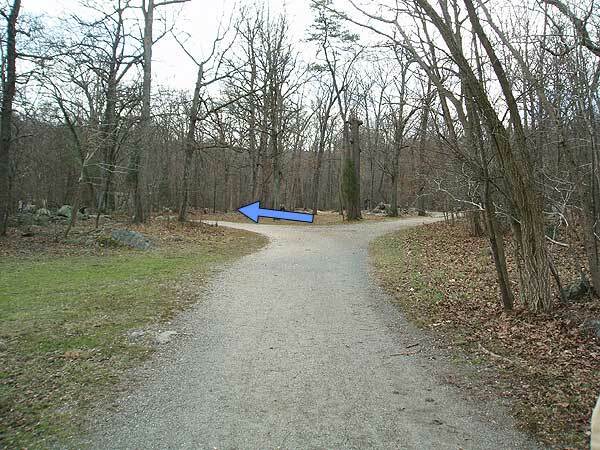 Whichever way you do this hike, be VERY careful crossing the road (and also when entering/exiting the lot in your car), because where you do so is flanked by a sharp turn in one direction and a blind hill on the other. We witnessed a couple very close calls this weekend. Last thing: My Garmin put this hike at 4.71 miles, with a couple little extra jaunts thrown in, so the 5.1 miles listed for this hike, while close enough, is slightly high, FWIW. 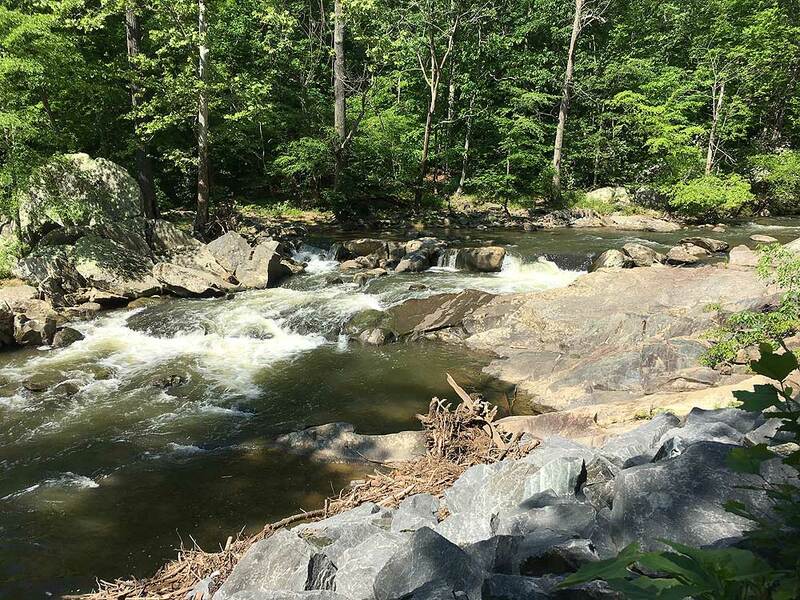 My son ,wife and I hiked this trail for fathers day. 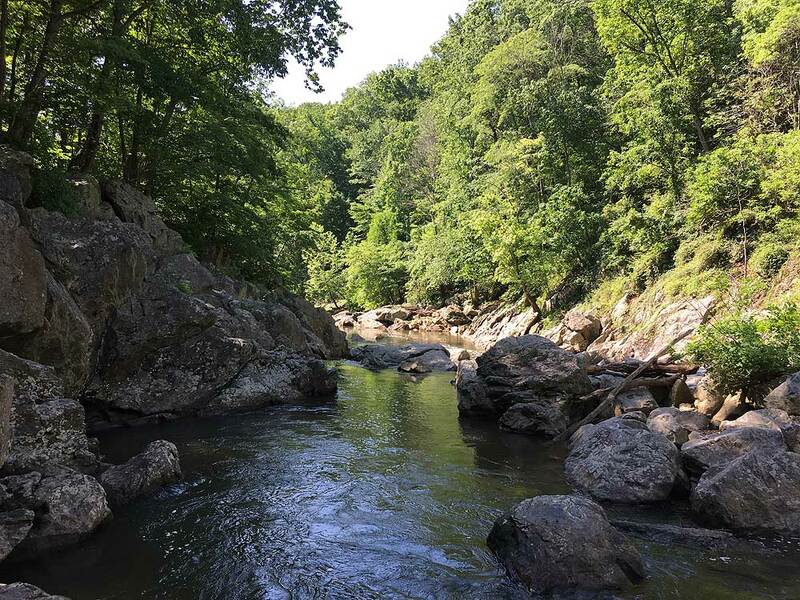 If you enjoy obnoxious drivers on the crowded roads of northern va and a 45 minute line leading into the park and crowds of sweaty smelly people this hike is for you. 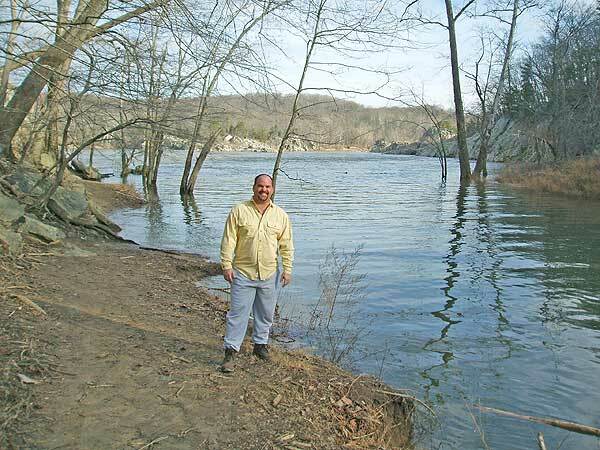 I did enjoy the views of the river, always wanted to see it. 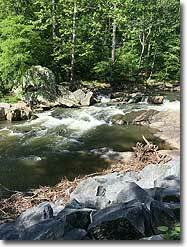 Other than the nice river views it was a nice easy walk in the woods, nothing spectacular. 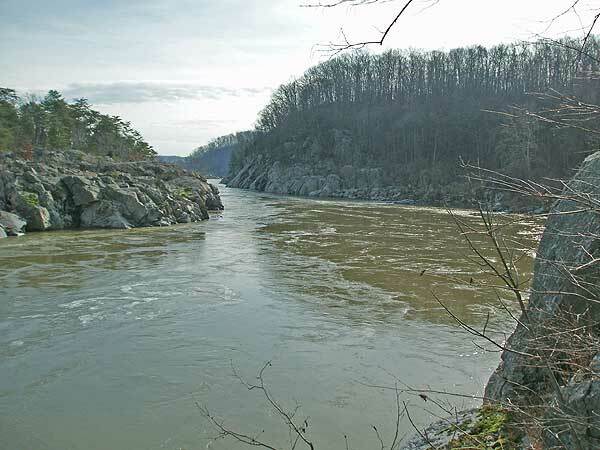 Now that I have seen it I will mark this one off my list as well as anything else in the vicinity of northern Va.